Before your fall TV schedule gets crazy busy, this Tuesday night, Reelz ChannelÂ is unspooling Bomb Girls, a series that ran earlier this year in Canada to much acclaim. 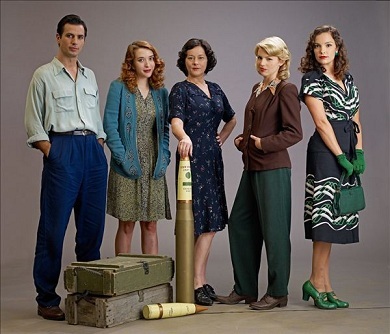 Set in World War II Canada, the show follows the professional and personal trials of a handful of ladies pulled into the work of building bombs for their boys abroad. Cut from the same cloth as the much-beloved Homefront (which ran on ABC from 1991-1993), it’s a period piece through and through from the red lipstick to the music to the pinstriped hose, and clocking in at just six episodes, is well worth a look. The series is most notable for pulling the fabulous Meg Tilly out of semi-retirement, and netting her a much-deserved Canadian Leo Award this spring. Here, she’s the matriarchal shop head, Lorna, running the show at work and leading a quiet and confining life at home with her war veteran husband, Bob (Peter Outerbridge–whom eagle-eyed viewers will recognize for several things but most recently for his stint on Nikita). Gladys, who’s eager to get out from under the picture-perfect life she’s supposed to be leading as the daughter of one of the town’s wealthiest families. Kate, a girl who’s lied about her name and her backgroundÂ after fleeing an abusive preacher father with her mother’s help. Betty, the brassy established line worker who takes Kate her under wing. Edith, a working mom who’s life takes a turn toward the difficult. Vera, a flirty gadabout who gets hurt on the line and realizes there’s more to her life than being a pretty face. In addition the always terrific Outerbridge, there are a couple of other handsome guys in the mix, too. Lorna’s male counterpart at the plant is Marco (played by Antonio Cupo, who some of my fellow Lifetime movie junkies will recognize from a flick he did a few years back with Laura Leighton called Love Song), an Italian-Canadian she’s inherently distrustful of until she takes the time to get to know him. And Gladys’s fiance, James (Being Erica‘s Sebastian Pigott), who is tested on whether he’s with her for her or for her dad. The series speeds through its six fairly tight episodes with a mix of drama, humor, romance, and a dash of suspense. 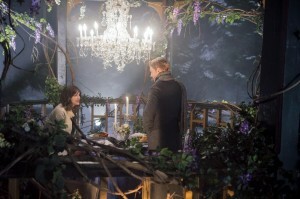 It deftly sets up the second season, which is filming now and will premiere in Canada in the spring. 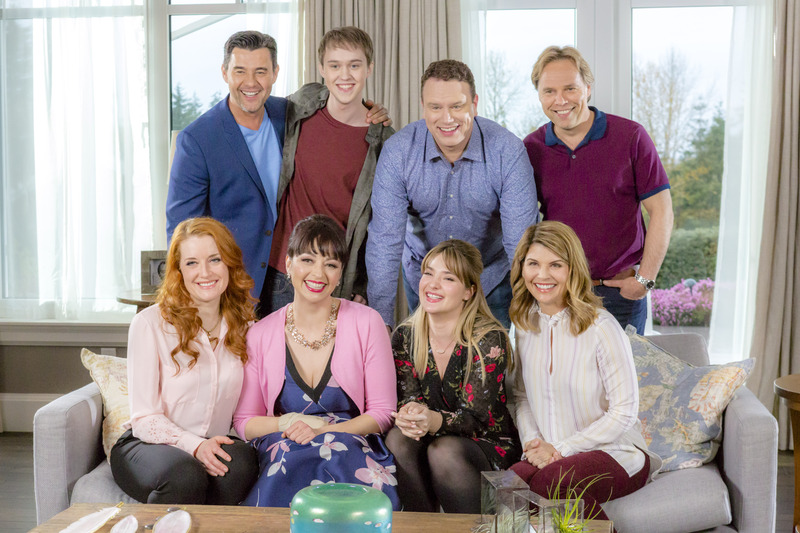 Reelz has already dipped its toe into airing Canadian programming with XIII, which premiered earlier this summer. While Bomb Girls is about as far as you can get from that show, it’s still nice to have an outlet for Canadian shows on networks in the States. Bomb Girls premieres Tuesday night atÂ 10 pm/9c on Reelz and repeats throughout the week.